Windows systems administrators rely on several Distributed Management Task Force (DMTF) industry standards to make our lives easier. The DMTF is an industry consortium whose membership includes major computer hardware and software manufacturers. Their goal is to agree on standards so their products work together as seamlessly as possible. In this article, we’ll look at how to apply a couple of key DMTF standards to help us be more effective with Windows PowerShell–based systems administration. The Common Information Model (CIM, pronounced sim) is a DMTF specification that describes computer hardware and software components. CIM is part of a larger systems-management framework called Web-Based Enterprise Management (WBEM). Every Windows server or client computer has a local CIM repository. As systems administrators, we can tap into that CIM repository to fetch and set properties and take action on the repository data. Although it’s a long-time DMTF member, a while back Microsoft made the ill-advised decision to write its own abstraction layer on top of CIM, called Windows Management Instrumentation (WMI). What’s confusing to many admins is that in Windows PowerShell v3 and later we can access the CIM repository by using either WMI or CIM calls. One of my goals in this article is to show you the pros and cons of each approach. Let’s begin by running through a simple example to help us visualize the CIM repository. At the moment I’m running a Windows 8.1 computer on which I’ve installed the free and open-source WMI Explorer desktop application. Figure 1 shows an annotated user interface. We start using WMI Explorer by clicking Connect to load the current computer’s CIM repository (annotation A in Figure 1). The namespace is the highest level in the CIM hierarchy. In my experience, we use ROOT\CIMV2 almost exclusively for Windows systems management. When we double-click ROOT\CIMV2, after a moment the Classes pane populates (annotation B). Whereas a namespace defines a group of related classes, the class itself is a blueprint (definition) for a particular hardware or software component. Type service in the Quick Filter list and double-click Win32_Service to load all service instances on the local computer (annotation C). If we think of a class as a generic object blueprint, an instance is an individual copy of that blueprint. Any Windows computer has many services running, so WMI Explorer displays a mighty big list of service instances. Type spooler in the Quick Filter list and double-click Win32_Service.Name="Spooler" to load the properties of that instance (annotation D). Earlier I explained that WMI is Microsoft’s implementation of CIM. 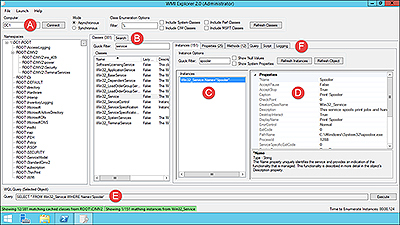 Microsoft also created the WMI Query Language (WQL) to give admins a method that works like Structured Query Language (SQL) for accessing CIM object data. If you don’t yet know SQL, I’d encourage you to learn it, because you can apply that syntax in WQL to query system configuration data. Instances: Defines the object and shows selected attributes (properties) that describe the object). Properties: Full list of properties, along with their descriptions. The window that shows the MSDN documentation is especially helpful here. Methods: Actions that an object can perform. For example, we can call StartService() and StopService(), respectively, to start and stop the given service. Query: Use WQL syntax to run ad hoc queries against the current object. Script: Generate a PowerShell script from the current query. Logging: Status messages reported from the CIM repository itself. I don’t want to spend too much time on the WMI cmdlets because, frankly, Microsoft is deprecating them in favor of its own CIM cmdlets. However, you’ll still need the legacy WMI commands if you’re supporting computers running Windows PowerShell v1 or v2 or if legacy scripts are used in your environment. Sure, it works, but at what cost? The underlying network transport involves DCOM and RPC, which are older, “heavier” protocols with corresponding reduced network performance. DCOM and RPC use dynamic port allocation, which means that you’ll have difficulty on most networks unless the appropriate firewall rules are configured. Remote computers are queried serially rather than in parallel. These three issues (especially the firewall port issue) can plague your work with annoying problems. For instance, frustrating “No RPC server available” error messages might crop up when you use Get-WmiObject, because the cmdlet is trying to use random TCP ports. $mem2spool = Get-WmiObject -Query "SELECT * FROM win32_service WHERE name='Spooler'"
As we’ll see next, the “new school” CIM commands don’t have methods-or at least not initially. Whereas the old WMI cmdlets use stateful connections for remote access and trip over existing firewall rules, the new CIM cmdlets run in a much leaner, meaner fashion, thanks to their use of the DMTF Web Services-Management (WS-Man) protocols. HTTP/HTTPS transport and XML serialized data streams make the remote access extremely firewall-friendly. WS-Man remoting is stateless, which means faster performance than with the older DCOM/RPC methods. Remote computers are queried in parallel, in what Microsoft calls a “fan out” remote management scenario. Get-CimInstance -Query "SELECT * FROM Win32_Process WHERE name LIKE 'n%'"
$mem1spooler = Get-CimInstance -ComputerName mem1 -query "SELECT * FROM win32_service WHERE name='Spooler'"
Remember those useful methods that become available when we use Get-WmiObject to create a variable to hold a remote server’s spooler service? Not so with Get-CimInstance. The reason is simple: WS-Man remoting is stateless, so there’s no persistent link to the remote computer’s CIM repository. Previous PostPrevious What does PowerShell’s [CmdletBinding()] Do?